So you have a website? That’s a great first step, but – it’s like having a store, and no one knowing anything about it. So, the real question is how do you attract people to visit your website like you would attract people to visit your store? First things first… You’ll want to develop a digital marketing strategy. This will help give you direction and purpose in what you’re trying to achieve. Social media is a great way to increase website traffic because it is all about the conversation. Short format usually takes the space of social but encourages people to visit your website to find out more. Coming up with specific content for social media ensures that you will have more of an active presence. That part is the key: social success will only come from an active presence. Make sure to optimize for each platform, whether that consists of having the same or different content from platform to platform. The frequency of which you post is very important as well; experts recommend posting at least 5 times a week. Another big part of social media is keeping up with engagement. Make sure to respond to others questions or comments. For example, if someone private messages your business on Facebook make sure to respond in a timely manner. Also, provide them with supplement information that could direct them to your website. While it is important for your business to engage back with consumers, it is also important for your brand to engage first. By this, we mean going to others social pages and reacting to their posts with a like or a comment. Engaging first is a great way to get others to recognize your brand and let it be known that your brand has an active social presence. All of these tips and tricks will, of course, amp up your social and might lead them to your website. What can you do to truly improve your website traffic? Going off of what we said above, another good way of improving website traffic is having a social influencer talk about your company or brand, promote your products or services and give raving reviews of why they should find out more about your brand. A good social influencer will redirect them to your website to find out even more! Networking with these people opens huge opportunities of increase to your website’s traffic. If you can’t find an influencer, the least you can do is build a strong relationship with a network of people who would be willing to share your content. Make sure to embed social sharing buttons into your website. These can consist of Facebook, Twitter, Instagram, LinkedIn, Pinterest, Google+ and any other platform you may be on. We recommend using your top three to four platforms because having too many social sharing icons can overwhelm the user and make for a longer page load time. Promote your website through social. Yes, this is as easy as it sounds. Make sure to share website content or just your general website URL through social. This can absolutely increase website traffic because you are giving them the direct link and all they have to do is click to get there. Obviously, there are more appropriate platforms to share this type of content on such as Facebook or LinkedIn, rather than Instagram where you can’t link a URL in the post. Blogging is the most direct way to maintain and improve your organic, online traffic. Organic search results are the web page listings that most closely match the user’s search query based on relevance. Ranking high in the organic results is what SEO is all about. Search engines look for high quality and relevant content. The more quality blogs you publish, the more other websites will reference your content creating natural backlinks and improving your online visibility. Backlinks also known as inbound links are generated whenever another site links back to yours. The more backlinks your site has, the higher your search engine ranking. Create blog topics that are universally interesting and relevant to your industry. By using the right imagery and making sure to have an inviting blog title, this is a recipe for driving traffic to your website. Incorporate blog graphics, pictures, examples and internal links. You’ll want to make sure to include alt text on all images if for some reason they don’t show up. Using long-tail keywords, topic tags, meta-descriptions, and simple URL structures will all help search engine optimize your blog content. Don’t forget the blog is meant for the website, but don’t be shy to share blogs on social and email. This will bring the conversation around your curated content. Remember the more eyes you can draw in, the more chances you have for conversions! Although there are many ways to reach your audience online, email marketing remains effective. According to Campaign Monitor email is 40 more times effective at acquiring new customers than some social media platforms like Facebook or Twitter. Not only is email marketing still relevant, but it can help you boost website traffic when done correctly. An enticing subject line and personalization goes a long way. If you can get consumers to open your email then you have a chance to show them more about your brand and redirect them to your website. Usually, an e-newsletter contains updates or notifies them of a recent blog post that went out. It’s always a good idea to have an internal link or icon redirecting them to your website and always encourage people to take action. For example, say MAKE Digital Group sends out a monthly newsletter and gives updates on what is happening within the company. We might include a few recently posted blogs that people haven’t seen. The key to directing people back to the website is only adding a snippet of the blog in that email to get their feet wet, this may include the blog title and a short summary. Then including a phrase such as, “To read the full version of this blog head to our website,” with a link to encourage viewers to go read the whole blog post. Your content is not the only thing that needs to be optimized. Did you know that your website design can also impact your search engine result page rankings? Not to mention that the design of your site has a big impact on the customer experience. In today’s digital world having a mobile-friendly website design is no longer optional as it used to be. More and more consumers are using their mobile devices to get online, so it’s important that you make sure your website design is also responsive. Mobile users should be able to be access, view, and navigate your site from any device. While there are many factors that go into website design, optimizing for mobile is certainly the most relevant in this day and age. Other elements of a web page to consider would be the more obvious ones like eye-pleasing aesthetics, site speed, and easy navigation. On April 21, 2015, Google implemented a new guideline and now rank websites by their mobile-friendliness. The change affected mobile searches in all languages worldwide and has had a significant impact in Google Search results. This is just a factor that will help users get relevant, high-quality search results optimized for their devices. You can check your site by testing your pages with the Mobile-Friendly Test Tool. This will show how Google Search sees your mobile pages. Here is the Mobile Search Engine Optimization Guide offered by Google to help your site show up in more search results. 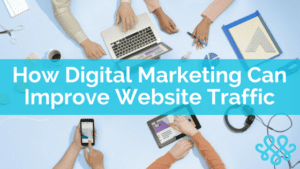 From social to web design, implementing these practices is what will get you ranking higher in SEO and gaining more web traffic. Search Engine Optimization, or SEO, is a vital part of bringing visitors to your site. The better optimized your content is for search engines, the easier it will be for users to find you when they need you. Producing quality content, updating content regularly, optimizing meta-descriptions, making sure all images include alt text and internal linking is the recipe for ranking higher in SEO searches organically. Also, make sure your keywords are specific enough to narrow down search engine results, otherwise your SEO will get lost in the rankings. For example, instead of having your keyword be “marketing,” make it more specific to your content like “how digital marketing can improve website traffic.” These are all aspects that will increase your search engine rankings, online exposure and ultimately will drive more traffic to your website.